Overview - Oliver meets the irreverent and unpredictable Anna only months after his father Hal has passed away. This new love floods Oliver with memories of his father who -- following 44 years of marriage -- came out of the closet at age 75 to live a full, energized, and wonderfully tumultuous gay life. The upheavals of Hal's new honesty, by turns funny and moving, brought father and son closer than they'd ever been able to be. Now Oliver endeavors to love Anna with all the bravery, humor, and hope that his father taught him. From birth toward death, every step we take as human beings is a movement toward something. Some greater truth or understanding that often remains elusive. Some deeper idea or concept of self that can't ever seem to fully take shape or come into focus. At first we are molded and sculpted by our parents, through both nurture and nature, until we are eventually thrust out into the open to fend for ourselves, to either learn from or repeat their same mistakes. Throughout it all, one nagging question fills our hearts and minds, as we succeed and fail, as we sabotage and self-destruct, evolve and grow. Who are we, or perhaps more importantly, who may we yet become? While adulthood may be defined in numbers, there is no real set age that dictates when we are suddenly complete, and there is no period of time when we abruptly stop learning, when it all magically makes sense. In some respects, even the oldest and wisest of us all, are still only mere novices at life. From director Mike Mills, 'Beginners' taps into these concepts of growth and transformation with an understated, humorous, and beautifully romantic story full of truth, wit, and love. While answers may forever remain elusive, through its characters' bittersweet journeys, the film asks the all important question, "When will we be real?" The plot follows Oliver (Ewan McGregor) a lonely graphic designer who falls into a state of depression after the death of his father (Christopher Plummer). At a costume party he meets a beautiful young woman, Anna (Melanie Laurent), and soon attempts to re-open his heart toward love. Parallel plots dealing with past events in Oliver's life also take form, mostly focusing on his father's decision to come out as a gay man at the age of seventy five, which then contrast with and inform Oliver's own romantic drama. Eventually the lovelorn artist must decide whether to take his blossoming romance to the next level or simply let himself once again fall victim to his own personal hang-ups and penchant for self inflicted sadness. The script is structured in a rather unconventional manner, with Mills forging a mosaic of often autobiographical memories and sequences that form various plot points which contrast against one another. The main narrative thread follows Oliver and Anna as they fall in love, which is then juxtaposed against memories of Oliver's relationship with his dying father, as well as more past experiences with his mother as a child. These various time periods and moments are weaved together into a poignant tapestry of past and present, with the temporally disparate sequences informing and enhancing each other in both subtle and significant ways. The manner in which we move from one time period to the next is effortless, with Mills employing a natural, organic ease to his cuts, creeping one moment into the next, often using music to help bridge the gaps, engendering a gentle flow of images and sounds. Stylistically, the director creates a brilliant fusion of naturalistic cinematography with more formalistic flourishes. Oliver narrates several montage sequences throughout the film which feature historical medleys of sorts, with a series of stills that detail the cultural bullet points of certain time periods that pertain to the story. Who was president when Oliver's parents got married? What were movies like then? How did people dress? What did love look like? It's all illuminated in a creative slideshow of images and voiceover that provide often moving insights. Detours focusing on Oliver's quirky graphic designs are also present, including a wonderful set of drawings that illustrate the sordid history of sadness through deceptively simple doodles. In between these more overt techniques, is a stripped-down shooting style that presents a refreshingly understated visual aesthetic. Mills and his cinematographer use mostly practical lighting, which avoids the artificial perfection of most Hollywood efforts in favor of a more honest and raw visual style. Coupled with the straightforward but lyrical cuts between shifting time periods, the elegant but realistic images take on a quiet, romantic beauty. An entertaining blend of comedy and pathos, the story develops a sweet, low-key sense of humor. Laughter is often elicited from everyday, common interactions and a kind of subdued eccentricity that runs throughout the characters. Oliver's inclinations toward gloom are actually quite funny, and McGregor is outstanding in the role, bringing levity and poignancy to the character. He is the glue which holds the film together, and demonstrates remarkable range and chemistry with his three main co-stars. Every scene he shares with Laurent features an absolutely palpable spark, and the beautiful actress simply glows onscreen. While aspects of her character tend to fit a kind of "indie fantasy woman" archetype that's become rather prevalent in the last decade or so, she still manages to craft a well-rounded, multi-layered woman that is strong and vulnerable while remaining utterly irresistible. As Oliver's dying, gay father, Christopher Plummer is fantastic. The sequences the two actors have together are among the film's most emotional, funny, and ultimately heartbreaking, and Plummer brings a level of nuance and graceful believability to the role. Of course the real scene stealer here isn't one of these famous stars at all. No, the standout performer is actually… Cosmo the dog. In the role of Arthur, Cosmo reveals himself to be one of the most impressive four legged thespians I've ever seen onscreen. Oliver will often speak to Arthur as if he is a real person, and with the help of some humorous subtitles, Cosmo does an amazing job of interacting with his human companion. In fact, their scenes together might actually be my favorite. While age may make us wiser, it doesn't always bring us any closer to understanding or embracing who we really are. Through a personal and heartfelt rumination on past, present, and everything in between, Mike Mills presents an exquisitely understated celebration of growth and romance. 'Beginners' is not only funny and sweet, but truly profound, in an honest and unassuming way. As comedy and tragedy blend, and the uncertainty of the future bears down upon the film's characters, it's revealed that happiness and sadness may not be so far apart after all and that it's never too late to start again. In the end, the movie expands upon one simple truth -- that life is merely a series of small and large moments, that each take us one inch closer to love and loss, and thus, to ultimately becoming… "real." 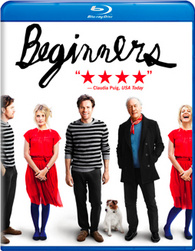 'Beginners' is brought to Blu-ray by Universal on a single BD-50 disc housed in a keepcase. Some skippable trailers play upon startup before transitioning to a standard menu. The movie is provided with a 1080p/VC-1 transfer in the 1.85:1 aspect ratio. Shot digitally in high definition with mostly natural lighting, the film has a fairly modest but artistically effective appearance. The source is mostly pristine with some marginal noise in a few nighttime scenes. Detail is solid but the movie's intentional low lighting conditions present a comparatively soft image. With that said, a few close-ups and brightly lit outdoor sequences do provide some standout clarity and depth. Colors are mostly subdued but there are some moments of pleasing pop, particularly with a red dress Melanie Laurent wears, or her shimmering blonde hair, or… actually, come to think of it, basically with Melanie Laurent in general. Black levels are consistent though overall contrast is on the low side. This is again a direct result of the director and cinematographer's reliance on practical lighting, with very few artificial sources used. While this gives the film a very naturalistic and creatively fitting look, the lack of lights can make the image appear a bit dim and flat. Also worth noting is a visual anomaly that pops up at about the 01:25:19 mark, when some faint but rather unsightly vertical banding lines appear in the frame and last for about five seconds. Whether this is somehow a defect of the original digital shooting methods, or the transfer itself, I'm not sure, but either way it's definitely not intentional. 'Beginners' features some lovely cinematography, but while I commend and appreciate the filmmakers' reliance on practical lighting (as a film student, there's nothing I hated more than lugging around and setting up complicated lighting rigs for simple scenes) the end result doesn't exactly make for the most conventionally impressive image. Still, with the exception of one brief but noticeable artifact, this is a perfectly fine transfer that respects the director's intended modest but graceful aesthetic. The movie is presented with an English DTS-HD Master Audio 5.1 track and a Spanish DTS 5.1 track. Subtitle options include English SDH, French, and Spanish. Filled with many romantic classical and jazz pieces, as well as a gentle but stirring original score, the movie features some fantastic music choices. Unfortunately, the song selection can't quite make up for an otherwise small soundscape. Dialogue is clean and crisp and though characters often speak in hushed tones and whispers, speech always comes through well. Directionality is negligible, however, with very little activity across the soundstage. Surrounds are reserved for faint music cues and minimal ambiance that add little to the proceedings. The aforementioned music sounds great, and while the choices are often delicate and low-key, they still come through with pleasing fidelity (though some older tracks feature an understandably aged quality). Bass activity is pretty much absent but balance between the effects, score, and dialogue is handled well. This is a very quiet film, and for the most part the small soundscape suits the content well, creating a soothing, romantic, and at times beautifully somber tone. Much like the video, the audio is very stripped-down, basic, but still artistically potent in its own subtle way. Still, a few instances could have definitely benefited from some more activity and immersion. Universal has included a small but welcomed assortment of supplements, including a commentary and featurette. All of the special features are presented with optional English, French, and Spanish subtitles. Commentary with Director Mike Mills - Mills provides a very soft spoken and laid back track full of information and entertaining anecdotes. The director addresses the autobiographical nature of the story and points out where fact ends and fiction begins. He also discusses the music choices, shooting in HD, the LA locations featured, his decision to use few lights, and all of the wonderful experiences he had working with the cast. It really sounds like everyone got along great and actually bonded closely during the shoot. With a nice mixture of technical and creative information, this track is an entertaining and insightful listen. A Short Film about Making Beginners (SD, 15 min) - Presented in standard definition with DTS 2.0 sound, this is a brief but interesting look at the making of the film with behind-the-scenes footage and cast & crew interviews. The participants discuss what it was like working together, the inspirations for the story, and the low-key shooting style. Mike Mills also shares some of his directing notes and discusses his process. A lot of time is also dedicated to the real star of the film, Cosmo the dog. Though filled with standard industry complimenting, the featurette has a genuine and honest feel that contrasts nicely with other fluffy promo pieces. Beginner Promo (HD, 1 min) - This is a quick promo for the film that features illustrations like the ones Oliver draws in the movie with Mike Mills narrating. 'Beginners' is a funny and honest film that manages to be refreshingly naturalistic and lyrically romantic all at once. With fantastic, heartfelt performances and a stripped-down but visually creative style, Mike Mills has created a personal, bittersweet, and ultimately joyous piece of cinema. Though the video and audio aren't terribly impressive by conventional standards, they suit the film well and convey a subtle, modest beauty. Supplements are slim, but the included commentary is full of worthwhile insights. This is a solid disc for an exceptional film that comes highly recommended.